Helen “Helenka” Shavzin (née Hurwicz) was one of the four daughters of Max and Sara Lea who fled from Warsaw to Moscow during World War I and never returned to Poland. Other than Adek, Helenka is the only member of the “first Hurwicz family” that I ever met, and the only one that Leo ever met except when he was an infant. Leo was with them until about the age of one and a half, when his family returned to Warsaw from Moscow. 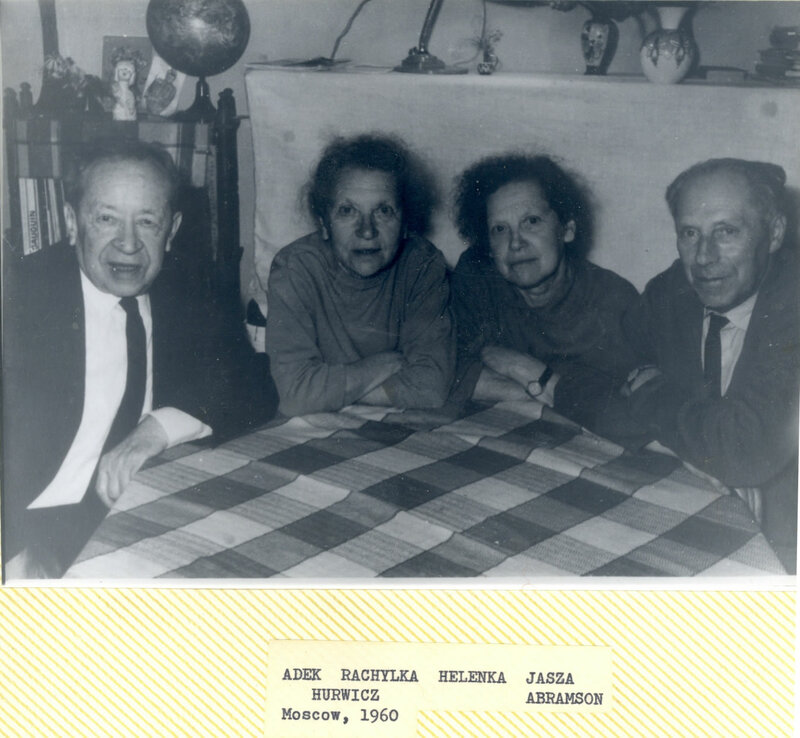 Adek did visit the family in Moscow (see picture below from 1960). Helenka emigrated from Russia to the U.S. in 1973 with her daughter, Svetlana, and Svetlana’s daughter, Masha. They came to Minneapolis, Minnesota, where Leo and Evelyn helped them get established. I think of Helenka as mostly energetic, smiling and generous, with many interests, including creating both visual art and participating in theatrical productions. By 1973, Adek was also living in Minneapolis, having moved there from Chicago. He had lived with Leo and Evelyn until they found an apartment for him a few minutes from their house. I always sensed that Helenka loved Adek with all her heart, though caring for him was not always an easy job. As an illustrative story, when Adek was close to death in 1981, Helenka was with him in the hospital, putting ice chips on his dry lips and generally doing what she could to care for him and make him more comfortable. At one point, wanting to know if there was anything more she could do, she asked, ‘Is everything all right?’ And though he had seemed almost comatose, he managed to lift his head up off the bed to shout, “Nothing is all right, you idiot!” For all I know, those may have been his last words. 2. Leo and Evelyn were at 3710 Thomas Avenue South, just south of Lake Calhoun. Adek and Helenka were on Dupont Avenue South, at about 35th or 36th Street, around a mile and a half east of Thomas Avenue and no more than five blocks north. I lived in Minneapolis from around 1969-1975, and again from 1980-1985. I visited both the Thomas Avenue house and the apartment house on Dupont many times. The building was owned by a Jewish relief agency of some sort, so they got reduced rent there.